Chris and I were on vacation. We were driving up the Gorge, and pulled off for lunch at the Braggs exit. It was all truck stops and travel centers, lots of tourist on their way. 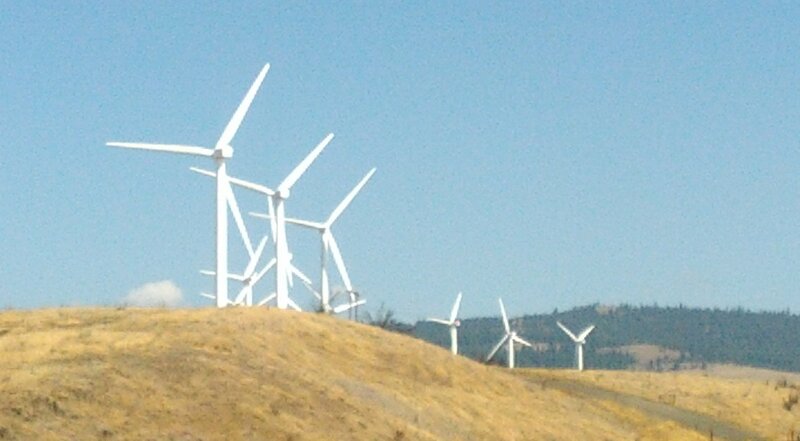 This wide open desert land along the Columbia River was all scoured rock and yellow grass. It had little to offer in attractions, other than convenience. We went into a restaurant, “Gloria’s”, and sat at the counter. It was typical, good, basic road food. I got one of the breakfast-all-day offerings. Chris tried pork chops and eggs. I had recently read a book about the founding of Astoria, the first European settlement in the Northwest, at the mouth of the Columbia. Two parties had traveled there, one by sea and the other overland. The overland route was right by here. The ocean voyage was by sailing ship, which the author brought out in details we do not usually think of. It would have been like a bunch of people cooped up in a space not much bigger than a commercial airliner, with equally no option to go anywhere else. Literally, for months. Bad food. Low water. Personality flares. We can scarcely imagine it. The overland party had the benefit of the Lewis and Clark expedition’s records, from a few years before. However, hostilities with some native tribes had flared, so the Astor party branched off to look for a different route. They found what we now know as the Snake River. This flowed along westward in a promising way for some hundreds of mile, but the travelers had no way to know about Hells Canyon. After deaths, and destruction of their boats, the survivors limped down the Columbia, right by where these truck stops are now, to their destination. The settlement struggled along for a year and some. Then a force of British ships arrived and took it over. The Americans had to make their way overland, back across the entire continent, as best they could. Again, right past where we were eating lunch. The author speculated that many early pioneers suffered what we now call Post Traumatic Stress Disorder, explaining for example the suicide of Meriwether Lewis a few years after the expedition. So here we were, just about two hundred years later. We can drive in air conditioned comfort through the desert. The land is prosperous with wheat and fruit and wind turbines. How did we get from there to here? Yes, there were horrible injustices to the native peoples, and downright stupid policies that needlessly inflamed their wrath. There is still plenty of misery in the world. But a lot is working. Chris had taken some pictures on his phone and wanted to text them to his sister. I didn’t much do texts, so I couldn’t help. But this big fat guy sitting on the other side of Chris started showing how. The guy looked to me like a gamer nerd, someone I wouldn’t expect to care about anybody but himself. But here he was, taking the time to help out this little black guy, with the sputtery cellphone connection. He suggested, with the low bandwidth, to only text one photo at a time. Our waitress had a careworn face, but a kindly smile. A Mexican guy sat down at the counter and started puzzling over the menu. When he began to order, our waitress raised a finger, just a moment. She went in back and returned with one of the other staff, a Hispanic woman. Through this interpreter, our waitress, went back and forth over the menu. I have just enough Spanish I could make out, “… you can get bacon, OR sausage, OR ham…” She made sure our Mexican customer got just what he wanted. This is who we really are, I thought. We help each other out. The news is full of brutalities and shootings. Sure. But they are, really, very few. That’s why they make the news. Instead, this is who we really are. We work together. The upcoming divisive election would have us believe we’re at civil war. But this is who we really are. One people, just making it all work, together. Categories: what's up | Tags: philosophy, slice of life, travel | Permalink.